I stayed at this hostel over the weekend with a friend and this hostel alone made it completely worth the trip and made it honestly one of the best weekends I've ever had. It was so cool to meet so many welcoming people from all over the world in such an open environment with extremely helpful and friendly staff. 11/10 I will be staying here again. A wonderful stay! Lovely people working there, very friendly and great daily free activities. Clean and very secure as well. I loved it! As soon as I got in I got greated by the hosts with a large welcoming smile and as a solo traveller I felt a warm. I immediately interacted with others guests. The fact that young volunteers are in charge of the hostel, I believe makes the experience much better. They had free morning snacks, free tip tour, free dinner, drinking games and then took us out to clubbing which I loved. Because as a woman I was sceptical to go party til 4am by myself. I was part of a family for 2 days!! Such a fun group of volunteers and very social hostel! Great place to meet new friends and located in a beautiful plaza with lovely restaurant literally outside the door. Can access the whole city walking from here. Clean bathrooms, showers and rooms! Good hostel with GREAT people working there!! One of the best pub crawls I've ever done with a hostel group! Definitely recommend!! 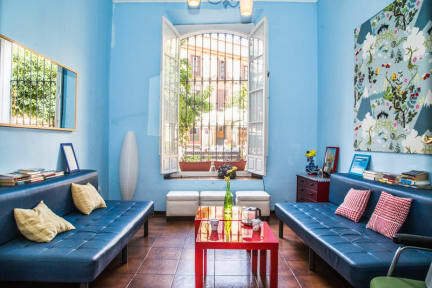 This hostel is located a little farther away from the tourist sites, but is located in a cute neighborhood in a small plaza. Staff was friendly and this hostel was quieter than some of the others I had stayed at in Spain. The hostel is in a wonderful location (within walking distance from the bus station and many attractions). Super fun atmosphere as well — they have a free dinner every night, followed by a pub crawl which was great. The only downside was the cleanliness of the room: the bathroom smelled really bad and the room itself was dirty and had obviously not been cleaned for a while. I would definitely recommend if you are interested in being social and don’t mind a bit of noise at night.